Authentic clay roofing tile for new construction and reroof for all residential applications. 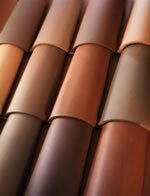 US Tile offers natural colors and blends to create a truly one-of-a-kind roofscape. Los Gatos Roofing installs all US Tile profiles, and can create custom installations to fit many architectural needs. US Tile also offers integrated solar roof tiles, and is the only roofing product Cradle to Cradle Certified for leadership in energy and environmental design.